It's strawberries and flowers galore this month at Tuesdays with Dorie with both recipes chosen from Baking Chez Moi featuring these ingredients in one form or another. This week I'm focusing on the Rose Fraisier, a classic French cake that celebrates one of my favourite fruits. 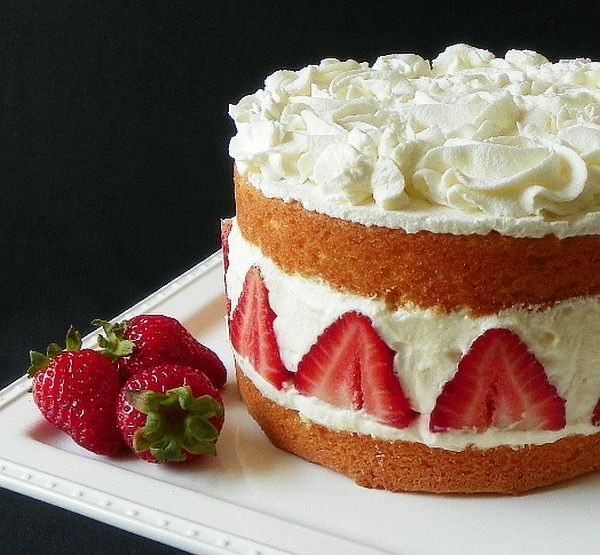 In reading the headnotes, I was very happy about the changes Dorie made to the recipe: her no-fail yogurt cake instead of a sometimes finicky genoise; fluffy vanilla diplomat cream in place of heavier (buttery) buttercream; a topping of cream and fruit instead of almond paste. She also introduced rose flavour into the cake with syrup and extract. I had no trouble finding the syrup but the extract proved to be a bit more elusive (and exorbitantly priced once I did locate it). I used raspberry flavouring that I had from another project with the rose syrup instead. The cake was moist and had a lovely floral flavour, the cream filling was light and airy and then of course there were all of those beautiful sweet, juicy berries.....so delicious. Visit here to see what the other members made. Wow, your Rose Frasier looks AMAZING! I wish I had it in front of me so I could eat it right now! Wow Wow Wow! Fabulous results you got there! Yes, this was dangerously delicious. Your frasier looks beautiful. Yours looks amazing! Did you use a mold or parchment to get the edges perfect? I did. I had trouble at the start with the strawberries around the edge keeling over so I wrapped it in a strip of parchment to keep them in place. Yours looks so good! And great idea to use raspberry... I am going to look and see if the book uses the rose extracts and flavorings anywhere else. If not I may steal your idea. I am also going to have to substitute as I am having trouble finding rose products and I don't have time to order. Your cake looks beautiful. A fantastic looking cake. What's your secret in keeping the filling layer so tidy, straight and neat? No secret, just a strip of parchment to hold everything in place during assembly. Wow! Your cake looks like it could go in a cookbook! I'm looking forward to trying this recipe! That is one good looking cake! You've made it look so pretty and elegant. I can't wait to try it next time around! I'm inspired! I didn't bake either of our two choices this week because local strawberries are just now coming in. I expect to go out picking this weekend and then we will be enjoying lots of strawberry desserts! Zosia, what a wonderful Rose Frasier cake , it looks absolutely delicious indeed 😉 and is a great dessert for the summer. Wow, your cake is gorgeous! I loved the flavors of this cake too. Your cake is absolutely stunning! I'm still considering making this, but at this point, it might be raspberries in place of strawberries.